Bharatpur Bird Sanctuary or popularly known as Keoladeo Ghana National Park is one of the oldest and most fabulous sanctuaries in India. Around 250 years back, Maharaj of Bharatpur created the park considering the phenomenal greenery and wildlife imbedded into the region. Since its inception, this beautiful place has been hosting several migratory and local birds all round the year. That is why; birding in Bharatpur sanctuary is the most popular activity. There are more than 300 species of birds in the park. However, the prime attractions of the park are migratory birds that come here all round the year. The best time to see them is during late summers and winters that is August to February. Cranes, Pelicans, Geese, Ducks, Eagles, Hawks, Shanks, Stints, Wagtails, Warblers, Wheatears, Flycatchers, etc are some of the main birds over here. Amongst the migratory birds, you can find here Coot Snipes, Spanish Sparrow, Rosy Pelican, Flamingo, Red Crested Porhad and many more. Well, there are several more attractions than birds only. Bharatpur Bird Sanctuary has an enriched wildlife that includes flora and fauna as well. Here you can find several rare species of herbs and trees as well. Amongst mammals, you can find here sambhars, jackals, pythons, otters, spotted deer and numerous other species. If you want to explore a true wildlife hub then there cannot be any better choice than Bharatpur Bird Sanctuary. Tour Bharatpur Bird Sanctuary this vacation..
Bharatpur Bird Sanctuary makes one of the best vacation hotspots in India. The best thing about the Bharatpur is that it is well connected with all the major cities. In addition, you can get plentiful options for transportations as well. Cabs, buses, taxis or anything else, you can get all the transportation facilities over here. If you want to stretch your stay in the park then you can have the best accommodation facilities waiting for you nearby the park. Hotels, forest lodges, guest houses or anything else, choice is all yours. Whenever you come to Bharatpur Bird Sanctuary then do not miss out the neighboring beauties as well. These are Bharatpur Government museum, Bharatpur Royal Palace, Lohagarh Palace, Deeg Palace and many more are some of the best holiday spots. The government run Bharatpur Forest Lodge is located within the vicinity of Keoladeo National Park that lies 190-kms from Delhi and 55-kms from Agra in Rajasthan. Laxmi Vilas Palace is located at a distance of 190-kms from Delhi and 55-kms from Agra in Rajasthan and is quiet close to the Bharatpur circuit house and bird sanctuary. The hotel has partially air-conditioned facility too. The mansion was built by rich Muslim nobles in the 1850's and its proximity to the mughal durbar is apparent in the architecture which reminds one of Fatehpur Sikri. The Bagh is a heritage hotel set in 12 acres two hundred year-old garden in Bharatpur Rajasthan, it is located just four hours away from major destinations such as Delhi, Jaipur and Gwalior. Hotel Udai Vilas Palace is nestled amongst 2 spacious acres, just a km away from The Keoladeo Ghana National Park, an interlocking ecosystem of woodlands, swamps, & dry savannah, home to over 370 varieties of birds. Hotel Pratap Palace is ideally located at 2 minutes walking distance from entrance to the Keoladeo National Park. A beautiful Pink Sand stone building beside the NH-11 built in 1994 now a leading hotel in very short time. Located a mere stone's throw from the entrance of the park, Birder's Inn is a quiet, peaceful haven for the keen birdwatcher. Bharatpur Bird Sanctuary is home of more than 400 species of exotic and rare birds, migratory water birds, indigenous water birds and land migratory birds. 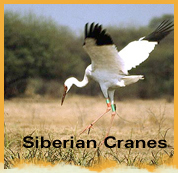 The main attraction of bird sanctuary is Siberian Cranes. This bird is known to travel distances of up to 6,500 km migrating from the Ob River basin region (Aral mountains, Siberia). Apart from Feredunkenar (Iran), Bharatpur Sanctuary is the only place where the Siberian crane migrates. The cranes arrive in December and stay until early March. Eagles, Ducks, Flycatchers, kingfishers, owls, Buntings, White Ibis, herons, Painted storks, geese, Hawks, Pelicans, Pipits, Larks, Shanks, spoonbills, Wheatears, darters, Wagtails, Warblers, Cranes, Cormorants, Marsh Harriers, Pale, Stints and Pipits are most common birds found in the bird sanctuary. Time to Visit : Park is open throughout the year. Best months are August-November for resident breeding birds and November-March for migrant birds. Bharatpur is on the Agra. Jaipur highway, just a two-hour journey by bus from Agra (55 km) and an hour from Fatehpur Sikri. The nearest rail junction is Bharatpur, which is well connected to Delhi, Bombay, Ahmedabad, Jaipur and many other parts of India.